I went undercover tonight in my crusade against the Chinese. It felt like backsliding, really, because I've been trying to avoid it, but it was for a good cause. I wanted to gain intelligence on their furtive, possibly evil ways. I went to eat at a Chinese restaurant. This is usually something I regret, for obvious reasons. The food is very spicy, there's a hundred choices, about six of them taste good, and there's enough nasty looking items on the buffet to make the six seem bad. Yet occasionally it's still a temptation I give in to, because once I had a good piece of chicken there and some kind of red pork. But that doesn't make up for the time the corn on the cob was rancid. In fact, most of the vegetables look bad enough that I scrupulously avoid them, so what do I have on my plate, about five different kinds of meat. Including lots of pepper shrimp. And a little bit of rice. Tonight, though, as already revealed, I went with an ulterior motive, to seek out signs of Chinese espionage against America, perhaps secret trapdoors, boxes within boxes, finger traps, dripping water, fortune cookies hinting at illicit rendezvous'es (? ), maybe illegal aliens serving as wait staff -- if I find something I might become known as the Lou Dobbs of Chinatown. And, who knows, if there's enough clues in this little strip mall dive I might lead a national effort, organizing a Minuteman brigade to guard the porous China/U.S. border. But after eating there tonight, something weird happened. They must have known I was coming and did something to the food. Some kind of spice designed to overcome my will. 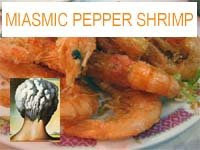 With just a few bites of the pepper shrimp I completely mellowed out. I was in such a condition of weakened will that I believe I ate a cheese mussel still clinging to its shell. Yes, it must've been the hyper-spiced super miasmic pepper shrimp. That's my word for it, leading to the state that followed, a psychological bombasia I hadn't experienced since the Leon Russell concert in '72. But this was a salty food unlike any I've ever tasted. It was like dying and going to a potato chip factory. I felt myself becoming very lightheaded and felt a strange swaying motion. I looked over at the chandelier above the broccoli chow mein and everything seemed alive. I felt like I was staggering as I went for more shrimp. Eating more and more, the sensation of motion left me and instead I felt a real honing of my senses; I could really think, like a computer making typewriter clicks and rings. I started taking in my surroundings. My eyes could see sharply, my sense of sound was keen. I listened to the waiters speaking Chinese and discerned their intent -- normal restaurant business. The people behind me laughed in conversation -- personal trivia with no greater meaning. I could read the lips of the folks across the way -- ordering iced tea. Even the manager and his son over by the cash register I could closely examine -- the boy was playing a game, a handheld electronic game. My senses were alive, but there wasn't a single bit of espionage. But I no longer cared. I ate another helping of the miasmic pepper shrimp, and it took away a lot of the anxiety I've had lately. There truly was something in it that seemed to make me tolerate the Chinese more and more. I went out of that restaurant no longer caring about their Communist government that much. And everything else I criticized them for, I decided to let bygones be bygones. Shake and be friends. Perhaps this was their evil plan all along, to make me friends with China. But I don't care a bit.